“People like Lassie, they liked Rin Tin Tin, but people love Benji,” director Joe Camp said in 1977. “Everyone who sees him wants to touch him, to hug him, everyone wants to love him. Why is everyone crazy about Farrah Fawcett-Majors?” The comparison hasn’t aged well (women, dogs, etc. ), but the general point abides: Benji was a limited-duration pop-culture phenomenon whose fiscal earnings in the first five years of action, according to trainer Frank Inn, totaled $75 million (close to $250 million now) by 1979. That wasn’t just from the two theatrical movies made by that date, of course: There were greeting cards, books, lunch boxes, calendars—the whole array of merchandising possibilities family films and blockbusters are now built around. Before Benji was Benji, he was Higgins the dog, canine co-star of Petticoat Junction. Trainer Frank Inn was the apprentice of Rudd Weatherwax, the original Lassie trainer. This is appropriate: On the continuum of on-screen family-friendly dogs, lovably scruffy Benji lies more or less precisely between the comparatively classy Lassie (who made his screen debut alongside Elizabeth Taylor in a glossy MGM production) and the decidedly proletarian Beethoven, the Uncle Buck of house pets (he’s rude, he’s crude, he’s family). Benji is a (yes, cute) mutt, and doglike to a stereotypical degree: a trash-can rifler, barker at cats, snatcher of stray sausages. Still, he’s domestic and not a destroyer of worlds. Joe Camp was a Texas advertising man with a script idea. When he wrote a film treatment in 1968, the industry response was (in his words), “Well, you can’t do that live, and if you do it in animation you’re talking Disney costs.” Enter Inn, who showed Camp 300 dogs before Higgins hit the mark. In Inn’s telling, Higgins had experience going for him: All the Lassies expired at 10, but Higgins was a seasoned 16. “This dog can do things no other dog has ever done,” Inn boasted in 1976. “He has more acting experience than any dog has ever had, and in this movie, he puts it all together.” For his part, Camp was a savvy, pragmatic shooter, making a film on the cheap and then successfully booking it across the country. The term “four-walling” is generally applied when a movie pays to play a theater, but it’s one Camp bristled at because it implies desperation: He sought out the best theaters in each booking area to create an aura of legitimacy, and was rewarded with 1974’s 10th-highest grossing film in the U.S. The original Benji is pretty dreadful, constructing its skeletal dramatic momentum from Benji foiling a robbery plot hatched by some very dim-bulb burglars who hole up in a decrepit mansion. It looks like what it is: a movie largely shot in or near suburban Dallas, padded out with filler in the grindhouse mode Grady Hendrix described as: “endless footage of people walking, people going in and out of doors, or people sitting and talking.” Benji primarily consists of the lovable mutt wandering over the same small number of locations, all of which were clearly shot on the same day: the park, a sleepy downtown diner, etc. There’s also a lot of padding on the human front. Benji’s family consists of two unappealing child actors, their hectoring dad (he hates mutts! ), and a theoretically endearing maid, all of whom define anti-charismatic. The movie is structured around long scenes of Benji strutting down the sidewalk that indicate how well-trained he is. One of the film’s paradoxes is that viewers have to be aware that this remarkably sentient dog is in fact just well-trained to respond to stimuli; we’re watching him at his best while pretending he’s an autonomous being. The best thing about the Benji films is easily the work of DP Don Reddy, who’s mostly been a journeyman camera operator since but ran the whole show for Camp. When Benji trots, the camera speeds alongside him on a rapid dolly. Similarly, the films of Argentinian arthouse master Lisandro Alonso (Los Muertos, Jauja) often rely heavily on long tracking shots of someone walking, with the camera’s pace determined by the subject’s. This is exactly the case with Benji, whose camera movements are precisely directed and timed to keep up with and showcase its canine star. Every moment filled with an overacting regional performer speaks to the production’s cash-strapped resources, but the movie does the one thing the audience wants: You get a full-on view of an incredibly well-trained dog, and the camera is always in the right place to showcase him. Camp didn’t want to do a sequel, but his 1976 camels-in-the-army comedy—the indelibly named Hawmps!—didn’t do so hot, so he reluctantly went back to the well. 1977’s For The Love Of Benji is an improvement on its predecessor insofar as it takes place in Athens rather than small-town Texas, meaning the scenery is better. Benji’s human family goes on vacation, and the dog has to travel in cargo. In a weird, nearly giallo-esque scene, Benji (now played by Benjean, daughter of Higgins) is taken out of his cage, chloroformed, and given a mysterious imprint by a man in a cheap suit. (The scene is partially, creepily shot from Benji’s POV.) Otherwise, it’s more of the same: lots of Benji walking and hitting his mark, a lot of time-killing footage—people looking for lost luggage, etc.—and a complicated plot that’s barely comprehensible. The local actors don’t appear to be the best ones money could buy, and there are long scenes in Greek, bizarrely with no subtitles. At the end, when the plot is explained, the maid marvels that it sounds like a James Bond movie. “Except in a movie,” exposition man notes, “I’d be Robert Redford and you’d be Jacqueline Bisset”—a sad meta-acknowledgment of the charmless lot we’re stuck with instead. Whatever non-dog charm the film has is in its very cruddiness: There’s time-capsule value in the original’s views of trapped-in-amber, last-picture-show Texas, and its sequel offers plenty of opportunities to see what a boxy airport looked like in 1977. Camp expanded the franchise to TV specials (there was a short-lived series in 1983 as well), then changed it up for the infamous 1980 follow-up, Oh Heavenly Dog. Where the first films bore the you-get-what-you-pay-for title card “A family film by Joe Camp,” Dog is a confused attempt to make the proceedings a little more adult. Benji is billed as himself, but the character is unnamed, instead serving as a vehicle for a Chevy Chase voice-over. Shamelessly cribbing from the recent Heaven Can Wait, Heavenly Dog has Chase as a private investigator in the U.K. killed while on the case; he’s assigned to a dog’s body by one “Mr. Higgins” (har har). This Benji is a literal horndog for Jane Seymour, who Chase meets as a human and pursues with canine avidity, leering at her and muttering “thank you” as he snuggles up to her breasts. At one point, he literally licks his lips while ogling a woman. There’s viler comic relief from Alan Sues as Chase’s flamboyantly gay partner, a bit of homophobic caricaturing that hasn’t aged well, and some oddly specific lampooning of the contemporary London art scene. It’s simultaneously unwatchable and rivetingly misconceived. One problem Oh Heavenly Dog tried to solve was how to move the franchise forward without being weighed down by a connection to a narrative about a family no one could possibly care about. It’s understood we’re watching Benji, but he’s no longer a family dog: He’s a star of that name with no character name. 1987’s Benji The Hunted takes that logic even further. In the opening scene, a reporter tells us that the beloved dog was lost at sea in the middle of shooting his latest film. This is either an exceptionally sophisticated meta-way to reset Benji’s status—as a stand-alone icon rather than a family dog with a history—or just more of the same shoddy storytelling. Inn appears as himself, broken up but convinced Benji will be okay. Cut to the dog paddling in to the beach, sodden but heroic. Benji The Hunted is, in relative terms, the best of the bunch, partially because it jettisons human characters almost entirely, acknowledging that viewers really have no use for them. 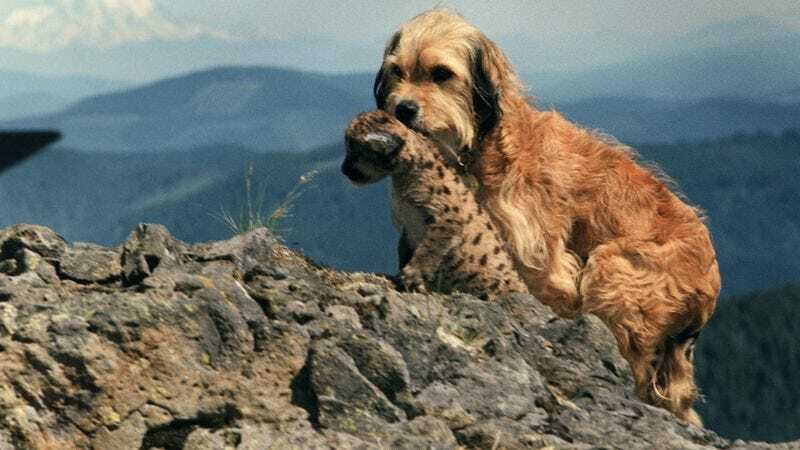 Instead, Benji becomes the adoptive father of a group of baby cougars, who are really weird looking, closer to the animatronic baby velociraptors in Jurassic Park than anything from the mammalian kingdom. Being a parent means about a billion overhead shots of Benji running back and forth through the forest: fetching food, staring down various animals, etc. This adoptive parent scenario also places the movie in a weird narrative bind. Since the cougars are carnivores, they need meat, and a rabbit soon emerges. In possibly the single least realistic display of animal behavior in cinematic history, a rabbit emerges and Benji chases it down, only to back off when confronted by its quivering little nose. The animal’s just too cute to kill! Good thing the one isolationist in the woods already has some dead chickens hanging from a line. Since they’ve already been killed, Benji can steal them without losing his lovability. Seventeen years would pass until the final Benji movie. During that gap, the family-film circuit got a tad glossier, leaving little mass theatrical release room for Camp’s cost-conscious methods and absolute lack of interest in production values. The ’90s saw the arrival of two new big dogs—Beethoven and the admirable Air Bud—both of whom spun off into direct-to-TV franchises that, improbably, are still going. So even though the world wasn’t crying out for the return of Benji in 2004, that’s exactly what it got. Benji: Off The Leash! is a comparative anachronism, and the meta-levels of who Benji is, exactly, reach new highs and lows. Hatchett (Chris Kendrick) is a tyrannical dog breeder who doesn’t care about the health of the dog’s mother; when she produces a mutt after rutting with somebody else, he tries to get rid of it. Instead, Hatchett’s son Colby (Nick Whitaker) rescues and hides the dog, which grows up to be predictably adorable, and, in a meta-twist, is cast as the “new Benji” in a movie that never got made (perhaps the one we’re watching?). In a Beethoven’s 2nd-esque subplot, two bumbling fools from animal control try to capture the mutt and bust the rogue breeder. You know what to expect: lots of falling down into the mud, tranquilizer darts meant for dogs ending up in someone’s rear, etc. The best part of the film is the end credits, when behind-the-scenes video shows how this final Benji was actually coaxed into action. The heavy pro-shelter, anti-animal abuse thread reflects Inn’s longtime conviction that the best, most trainable animals could be found in shelters; in its maladroit way, it’s an entirely earnest piece of proselytizing. But the mass-release market for dirt-cheap, small-town family fare of this kind had passed, and Off The Leash! came and went quietly. Camp has subsequently reinvented himself as a horse rancher and author of related books (The Soul Of A Horse), retiring from the family film genre he briefly dominated. Benji himself is now a piece of pop-culture ephemera: Not a syndication staple totem to be passed down from one bored generation sitting in front of the TV to another, but the dog that time forgot. That’s a just response to a cycle of lousy movies, but take a few minutes at least to appreciate the opening credits of the first film. Like the first three movies, it opens with a song—“I Feel Love,” sung by country star Charlie Rich—and it’s shockingly pleasant. That’s all you need. The rest is just trotting. 4. Benji: Off The Leash!